At Ricardo’s Restaurant, we’re known for the Best Filet Mignon from Erie, PA to Northwestern NY and Northeastern, OH. We have fans far and wide outside our area including Chicago, IL, Pittsburgh, PA and Denver, CO just to name a few. What makes our Filet Mignon so special? Whether you order our 4 oz. Filet Mignon and Butterflied Shrimp Dinner or our Full Cut Filet Mignon Dinner, we start with the best grain-fed beef available and carefully prepare it using our signature seasonings and proprietary cooking method and serve it to your specifications. We promise you won’t be disappointed! Many have tried to duplicate our results – but nobody comes close. We also offer a NY Strip Steak prepared with the same meticulous standards. Whether you’re looking for a light lunch and a hot cup of coffee with a co-worker or you’d like to have dinner out with your sweetheart or family, we’ve got the perfect menu selection for you. Ricardo’s Restaurant’s lunch menu offers a wide variety of soups, salads, sandwiches and pasta along with our famous fresh fried zucchini. Lunch Specials are available daily. If a nice family dinner sounds good, our generous portions and menu options are sure to please. We offer Steaks, Seafood, Chicken, and Italian Entrees along with Specialty Salads, Sandwiches and Appetizers. Don’t have time to dine in? Everything on the menu is available for take-out. Simply call in to order for pick up. When you can’t join us in house for the finest comfort food around, take out is a great option! 814.455.4947. From wedding anniversaries and business dinners to graduation celebrations and wakes, we’ve catered to the needs of our patrons for years! 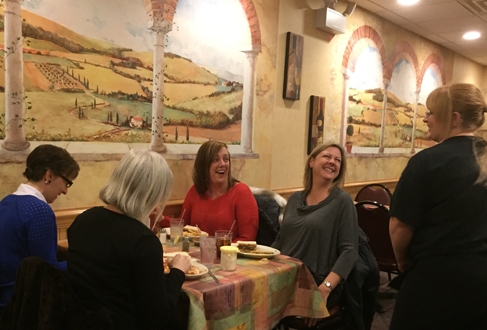 Ricardo’s is the perfect place to host your gathering. We take the worry out of your event and make it easy for you to spend quality time with friends, family or co-workers. We cater in-house to groups from 40-100 people. Please Click Here to go to our Special Events and Catering page for more details. 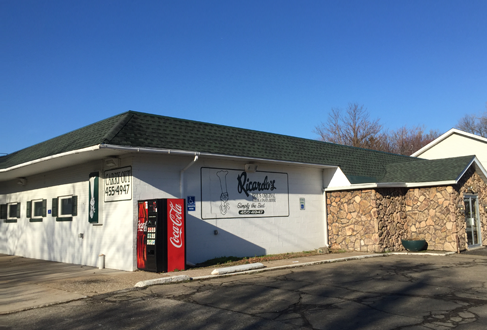 Ricardo’s Restaurant, conveniently located at 2112 East lake Road in Erie, PA, offers superb food and outstanding service. Whether you’re hungry for a nice steak dinner, traditional Italian fare or a sandwich and fries, we’ve got just what you’re looking for. Enjoy a casual lunch or dinner with friends in our comfortable dining room. At Ricardo’s, we enjoy what we do and it shows. From the fresh, top quality food we serve, to the friendliness and knowledge of our servers, we take pride in making sure that you have a great dining experience. 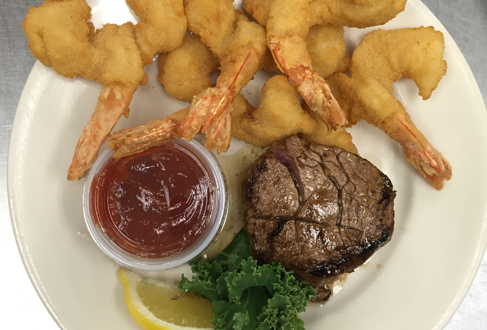 Our juicy, delicious Petit Filet Steak and Jumbo Shrimp dinner comes with fresh-cut fried zucchini, pasta sampler, your choice of potato or vegetable and bread with butter. It has long been a customer favorite and it’s easy to see why!